Lava Man, shown last October, earned $5.27 million on the track. 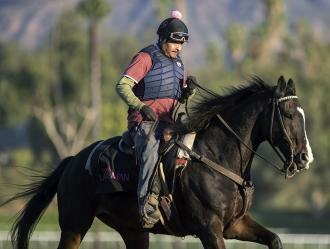 DEL MAR, Calif. – Lava Man, the popular Hall of Famer who was a multiple stakes winner in the late 2000s, is scheduled to leave a local equine clinic in the coming days after undergoing emergency surgery for colic last Tuesday. Lava Man underwent a procedure on Tuesday to correct a colon displacement. A 17-year-old, Lava Man won 17 of 47 starts and earned $5,268,706 from 2003-09. In recent years, he has been a stable pony for O’Neill.